Paintings, music, books, drama, exhibitions, and symposia have long made particularly important contributions of culture to greater tolerance and respect for other religions, races, and minorities. Such contributors use their artistic freedom and have been pioneers of peaceful coexistence for centuries. The Global Tolerance Initiative shows it “Art of Tolerance” at international art events all over the world. 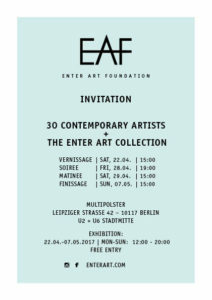 rt Cologne is the world’s oldest modern and contemporary art fair. It is open to everyone, from museum and gallery to curators, both private and national, to auction houses, artists, consultants, banks and insurance companies. This major event in the German city at the Rhine river will present over 200 leading international exhibitors, divided into thematic sectors, showing modern and contemporary art, paintings, works on paper, photography, video, sculptures, objects and graphics. 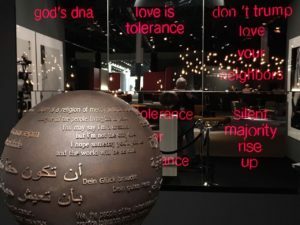 See the report about the Art of Tolerance at the Art Cologne here. 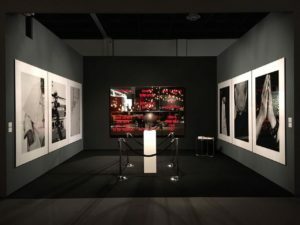 As a special event in 2017, the fair will present “The Art of Tolerance” by Hubertus Hoffmann in the VIP lounge, an art installation for the promotion of Tolerance vis-à-vis different religions and ethnic minorities, curated by P.C. Neumann from Basel in Switzerland. The show will encompass an invitation to the silent majority to stand up for more humanness, warmth and cooperation in their cities (draft design above). 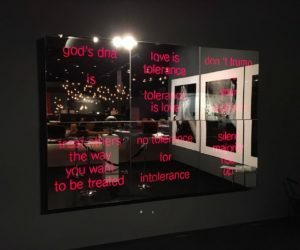 The video installation of six mirror boxes with neon signs inside contain The Codes of Tolerance: ” god’s dna – is – diversity” – “love is tolerance – tolerance is love” – “don’t trump – love your neigbors” -“treat others the way you want to be treated” – “no tolerance for intolerance” – “silent majority rise up”. They are based on the book “Love is Tolerance” by Hubertus Hoffmann. 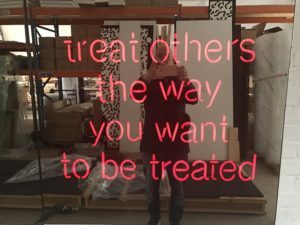 Read more on the neon art of the Codes of Tolerance. 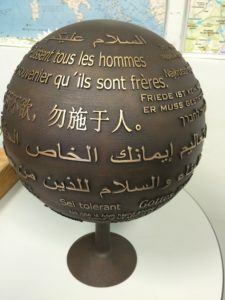 As well the prototype of The Globe of Tolerance is shown. Hubertus Hoffmann plans to dedicate Places of Tolerance with a localized Globe of Tolerance all over the world to promote the global ethos. Read more an the Globe of Tolerance project, including the translations. From the The Champions & The Art of Tolerance photos of two projects are presented in Cologne. Triptychons with three pictures each- C-print under acrylic glass, flush- mounted to alu-dibond- each picture 201 x 151cm- Large size edition 9 +2 AP- all three no 1-3 € 20,000 + VAT- Medium size edition- 15 + 2 AP, each 120 x 80 cm- all three € 12,000 + VAT, Small size edition 999- each 40 x 30 cm - all three € 1,950 + VAT. As sold by the artist, the reduced German VAT is seven instead of ninteen percent. More on the Champions of Tolerance. Pope Francis is one of our Champions of Tolerance. The Global Tolerance Initiative supports his credible promotion of love and tolerance with a Political Street Art Action Easter 2017 in Rome. We place and distribute 500 of these posters on bill boards around the Vatican from April 12th to 22th, 2017. Per l’ impegno profondamente cristiano di Amore e Misericordia, come richiesto da Gesù nella nostra Sacra Bibbia. May all cardinals, bishops, and priests read our Holy Bible with open eyes, hearts and minds and follow your wise advice with love. Let us all pray for you and the church with a thinking heart and a loving mind. During the famous Gallery Weekend Berlin, the Global Tolerance Initiative will show a new video-installation by Hubertus Hoffmann and P.C. 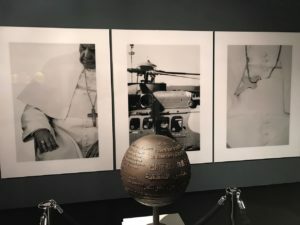 Neumann as well as the neon sign “no tolerance for intolerance” and two triptychs of Pope Francis and The Dalai Lama, in the Proud Collector section, in The Grand, April 28-30th, 2017. 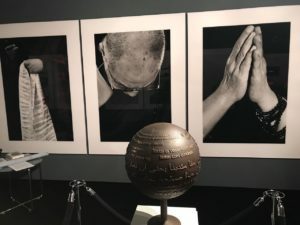 Hubertus Hoffmann presented The Champions & the Art of Tolerance and The Globe of Tolerance as well in the international Enter Art Foundation in Berlin in 2016. 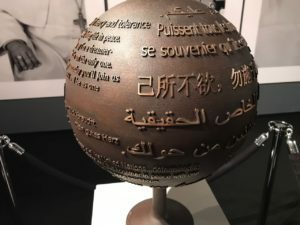 Bronze, each unique with individual mix of quotes- diameter 30 cm, stand10 cm - € 28,000 + VAT. Six light boxes as one mirror edition of 15 plus 2 artist's proof (AP),neon, plexiglas, one-way-mirror,powder-coated aluminum, electronic light sequencer, transformers, each signed, titled and dated on the reverse, each light box 90 x 90 x 11 cm (35.43 x 35.43 x 4.33 in.). Overall 270 x 180 x 11 cm (106.29 x 70.86 x 4.33 in.) Executed in 2017 this work is from an edition of 15 plus 2 artist's proofs- all six € 55,000 plus VAT. Triptychons with three pictures each- C-print under acrylic glass, flush-mounted to alu-dibond- each picture 201 x 151cm- Large size edition 9 +2 AP- all three no 1-3 € 20,000 + VAT- Medium size edition- 15 + 2 AP, each 120 x 80 cm- all three € 12,000 + VAT, Small size edition 999- each40 x 30 cm - all three € 1,950 + VAT.